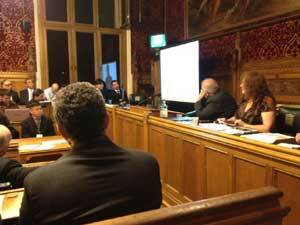 The conference in the House of Commons was attended by more than 20 MPs from various parties. They included parliamentarians Robert Buckland, John Denham, Tobias Ellwood, Mr James Gray, Mark Lancaster, John McDonnell, Caroline Nokes, Stephen Pound, Mark Pritchard, Dan Rogerson, Andrew Smith, Iain Stewart, Eric Ollerenshaw OBE, Bob Ainsworth, Jim Cunningham, Chris Huhne, Sue Clayton and Lord Avebury. 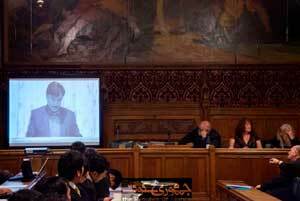 MPs on this occasion announced the formation of All Parties Parliamentary Group (APPG) on Hazaras to “address the issues faced by Hazaras in Pakistan to bring an end to the persecution and racial discrimination carried out against Hazaras”. Ian Stewart, who was the sponsor of the conference, pledged that he will set up the group and will visit Pakistan with his colleagues. Alan Johnson, who has become a leading campaigner on behalf of Hazaras, expressed frustration that previous meetings had called “that genocide of Hazaras ended and the perpetrators of this crime were brought to justice”, but there has not been a single conviction, there still hasn’t been a single arrest. As many as 5000,Hazaras have left Quetta city which is an enormous loss to the city, student can no longer attend the university due to fear, Hazaras are under siege of terror. MPs said in their speeches that the situation of Hazaras was grave, and they needed protection from terror groups and normal life restored to them. The MPs said the government of Pakistan had failed in its duty to protect its on people and that was a tragedy. They said Hazara professionals, businessmen and labourers were leaving the city as they were under attack. 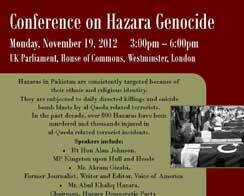 LONDON: Parliamentary Under Secretary of State at the Foreign and Commonwealth Office (FCO) reportedly said that Pakistani government officials support the killing of hundreds of Hazara Shias in Quetta, the capital of Balochistan. 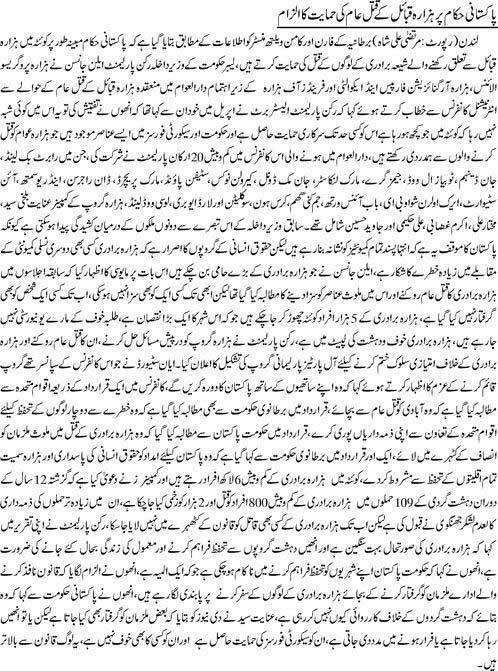 Senior Pakistani journalist, Najam Sethi, in his weekly program "Aapus ki Baat" (English: Between us) speaks about the dangers of Pakistanis in denial on the role of their government supporting the terrorist network committing genocide of minorities. Sethi also speaks about the London conference that the British Government is pointing to officials in the Pakistani goverment for being complicit in the genocide of the Hazaras. 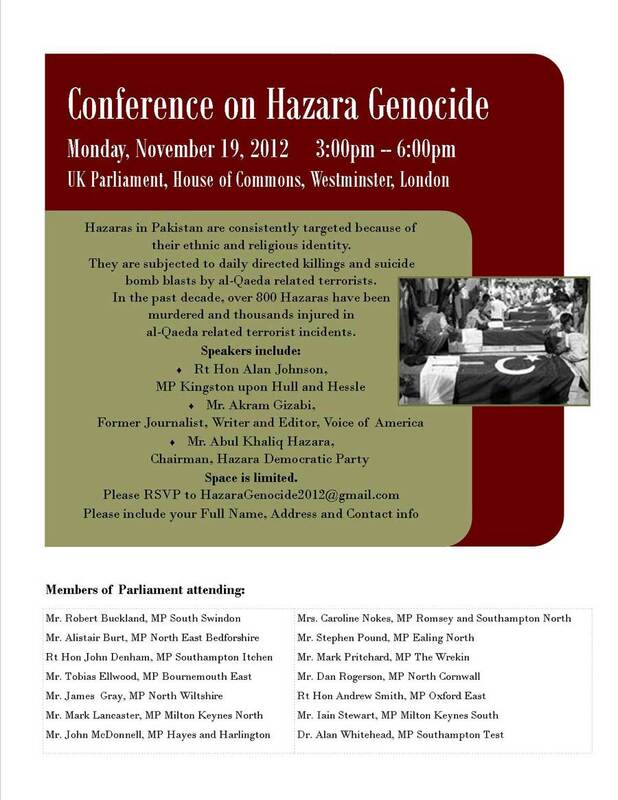 Hazara Progressive Alliance (HPA), UK - is an alliance of two Hazara Organizations with focus on raising the plight of the Hazaras in Pakistan. The organziations are, Hazara Organization (HO) mainly based in Milton Keynes although enjoys broad based support from Hazaras throughout UK and around the world. The other organization, Hazara International Forum (HIF), based in London, is one of the very active organizations that is involved in social, charitable, and advocacy issues pertaining to the Hazara community in UK and around the world. Friends of Hazaras (FOH), UK - A new organization headed by Luci Woodland, a british teacher, who empathizes with the Hazaras, with aim of creating broad based support among the non-Hazara British citizens. Hazara Organization for Progress and Equality (HOPE) - A global Hazara organization that has the hall marks of becoming a global Hazara think tank. 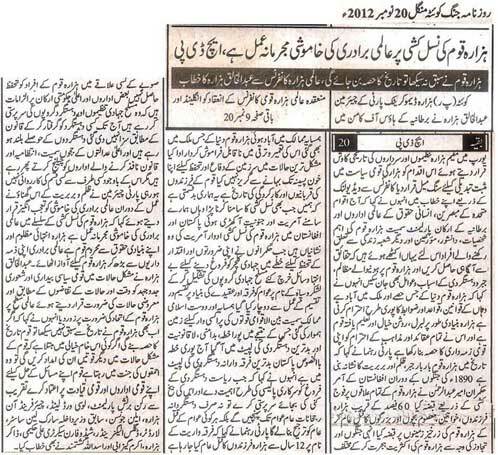 HOPE enjoys broad based support from Hazara intellectuals and communities around the world. HOPE is mainly focused on speaking on broader issues of interests/concerns for the 9-million Hazaras around the world. Hazara Democratic Party (HDP) - The largest and only Hazara political party representing around 600,000 Hazaras in Pakistan. The previous chairman of HDP, Mr. Hussain Ali Yousafi, was assassinated by Al-Qaeda affiliated terrorists on Jan 26, 2009. "World [Power's] Silence on Ethnic Cleansing of Hazaras Amounts to a Criminal Act"